It seems like no matter how often I’m convinced that I know and understand a given principle of photography, a situation comes around that shows me I really don’t know what I’m talking about at all. Case in point: this week’s picture, which I shot with my D7100, 50mm lens, and +4 close-up filter. (A set of gear that by now many of you are probably starting to recognize quite often!) I shot this when my friend Stacy and I were walking around Theta Pond one afternoon right before OSU’s annual homecoming celebration, and I had my camera with me even though I didn’t really plan on taking any actual photos. 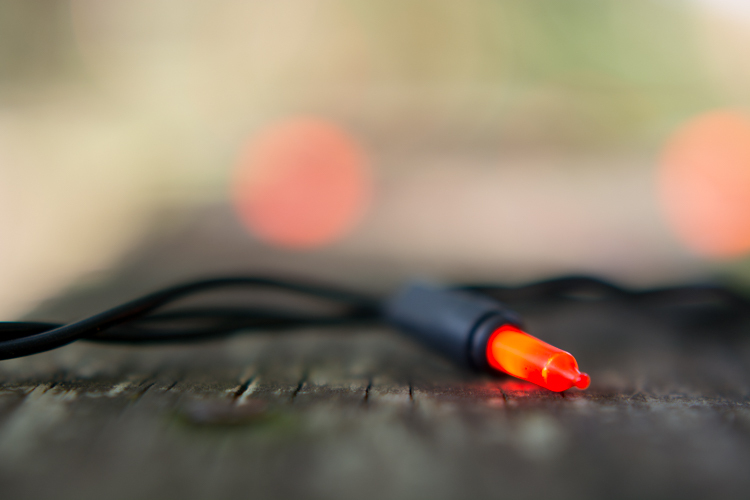 We were just out on a short walk to get the blood flowing after being in the office all day, and as we rounded the north side of the pond we saw these tiny little orange lights wrapped around the guard rail of one of the footbridges. I stopped, looked at the scene, and decided I would try and have a go at photographing it. My first attempt was without the close-up filter, and you can see the results below. It’s not that the shot was all that bad, but there’s not a clear subject on which to focus and overall the composition is just too busy to be pleasing to the eye. I mean, I guess you could say this one works but the focal point–the orange bulb two-thirds of the way down from the top–is not easy to distinguish next to the rest of the bulbs even though it is much sharper. The background blur is more distracting than pleasing, and though I suppose I could have cropped in to kind of get closer to the bulb I thought I would have much better luck if I just shot with a close-up filter. So I screwed on the +4 and, like a rank amateur, took a couple shots at f/1.8. Yikes. This one’s just a giant blurry mess, and while the bulb is clear there is no sense of context whatsoever which makes the scene basically pointless. I don’t know why I keep thinking that shooting close-up images with wide-open apertures is a good idea, but one of these days I’ll learn. And if not I’ll at least have fun trying :) The final image was shot at f/8 which still results in a razor-thin depth of field (though not quite as thin as the f/1.8 image!) but shows a much greater sense of time and place. I had to rest my camera on the railing and use live view to compose the shot, which would have been no problem at all on my D750 with its flip-out screen, but alas I had to make do with the D7100 since that’s what I had with me. And I think it worked out just fine, which is really all that matters in the end. Nice shot Simon. Thanks for the explanation of how you work out the best shot. I too find that for some reason I think that doing macro type images I ought to have the lens full open. It doesn’t take long to realize that it isn’t going to work. I will try using some of these suggestions in photographing Christmas lights. Thanks Dennis. Shooting close-up photos has been a constant challenge for me the past few years, as I can never seem to get it through my head that I don’t need to shoot wide open. And yet sometimes I go all the way to f/1.8 when I’m mere inches from my subject, thus rendering most of the picture a blurry mess. 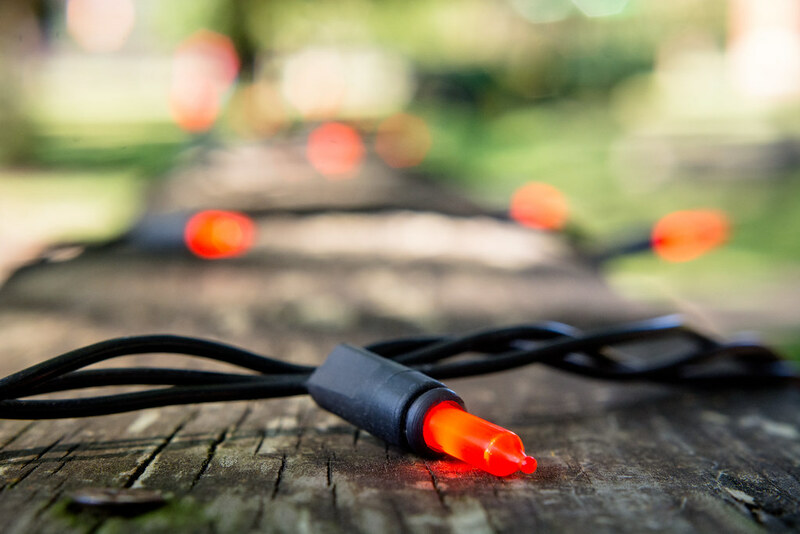 Good luck when taking your own Christmas lights photos, and I’m sure you will get some good images! You were ahead of the seasonal trend. 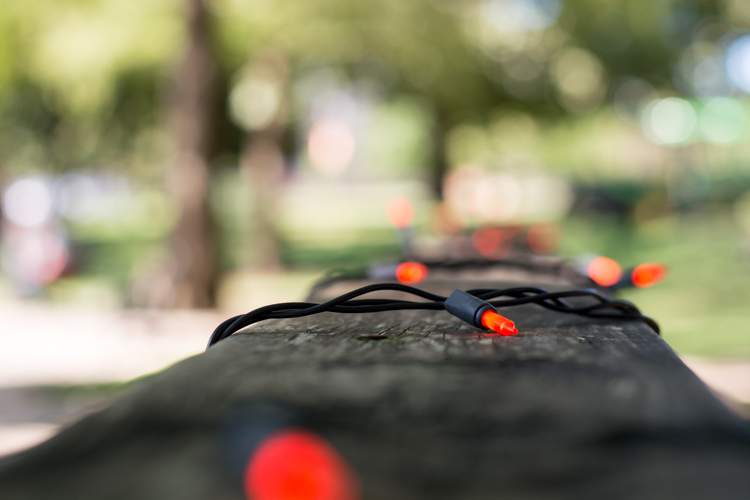 I see lots of FB posts recently about Christmas light bokeh shots. They are always fun to play with. not every shot it a winner, but the loser shot is the one that doesn’t teach you anything or lead you to the next best shot. the loser shot is the one that doesn’t teach you anything or lead you to the next best shot. I like the way you put that, Rebecca. Not every shot is a winner, but in a sense there’s no such thing as a bad photo since there’s something we can learn from all our pictures–even the ones that don’t turn out quite how we had hoped. Thanks for the reminder!